This is a photo of the first dance at a Barcelo Maya Palace Deluxe wedding. In this wedding picture, the bride and groom are dancing on a lit dance floor surrounded by fireworks. In the background, we can see the guests watching the bride and groom's first dance. 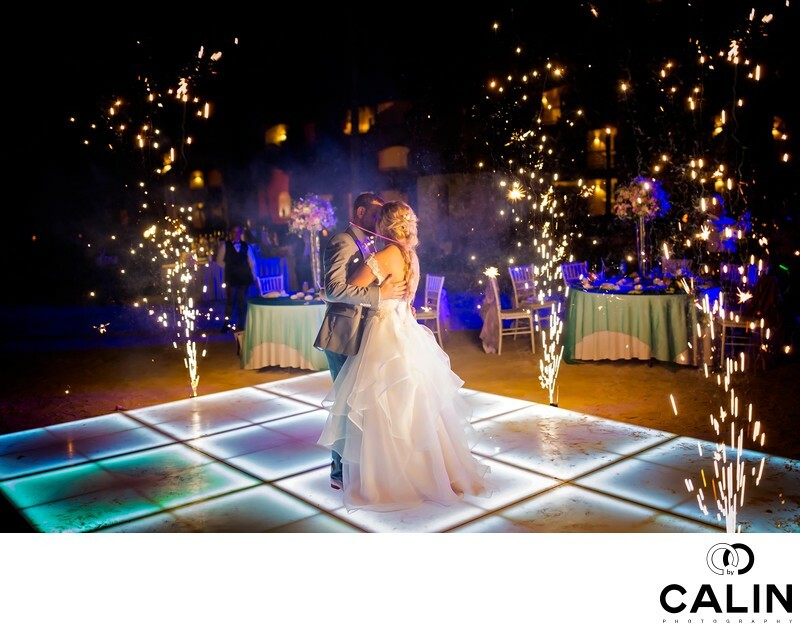 One of the options a couple can buy when booking a Barcelo Maya wedding, is the fireworks during the first dance. Despite the fact the fireworks cost about $250 and the last no more than six seconds, the visual effect is striking. That makes purchasing this package worthwhile. Capturing this image was challenging. First, I needed a strong light to illuminate the bride and groom and overpower the light cast by the dance floor. As such I use the powerful video light placed on a tripod close to the dance floor. The colour of them video light was tungsten, which matched the fireworks collar and my other backlights. Second, the bride and groom hugged each other and to everybody's surprise, tied their necks with a glow stick, which made it almost impossible for me to photograph their faces. Even more difficult, the DJ was projecting a blue light on the background, which was spilling onto the newlywed couple. However, that ended up working well for me because the blue background complements perfectly the orange skin tones and main light. In order to create this image I used a Canon 35mm 1.4 lens shot at f1.4 so I can capture the dim ambient light. This particular lens shot wide open creates a beautiful three-dimensional effect which makes the subject jump out of the frame. In other words, the shallow depth of field created by this wide aperture has an isolating effect on the subject. In terms of composition, this is a image where the subjects are placed close to the middle of the frame. Despite that apparently boring composition, the placement of the elements of interest (the fireworks) make this a striking photo. First there is a just of fireworks in the foreground then the bride and groom are in the middle ground. Finally in the background that we have two layers: the fireworks and the guests' tables. The layering gives this image depth and tells multiple stories, which makes this a powerful shot. Also, the fireworks acted as framing devices drawing the viewer's attention to the bride and groom. As a Toronto wedding photographer, I have a few tricks on my sleeve to enhance the images. Here, one of the fireworks were significantly weaker than the others so in post production I copied sparklers from the right hand of the frame and duplicated them on the left so that the image is perfectly balanced from a visual standpoint. Also, I corrected the white balance, then softened the bride's skin, then did some dodging and burning to tone down the fireworks. One of the main photography rules states that the subject (the bride and groom) has to be the brightest part of the picture. By reducing the fireworks light intensity, the bride and groom become the brightest part of this wedding photo. All in all, this is one of the most striking images I captured at this Barcelo wedding reception.